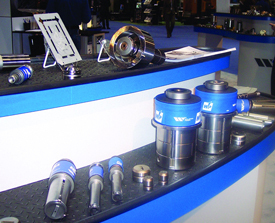 Now sporting three shows in one venue, the 2009 Fabtech International and AWS Welding Show including METALFORM that convened last November at Chicago’s McCormick Place felt like a huge mega-mall targeted toward shoppers of all sorts of forming and fabricating products. To see it all, visitors needed roller skates—perhaps powered skates at that. If you attended, along with the 25,000 others that did so, you undoubtedly came home with a long list of “toys” that you would have liked Santa to deliver. Or, for those that don’t believe—products that you’d like your company to invest in now or in the near future to allow your forming and fabricating company to keep pace with the rest of the industry in terms of productivity and quality. Filling nearly 400,000 sq. ft. of booth space that displayed the wares of more than 1000 exhibitors, the giant trade-show displayed more than 500 new products. What follows represents a small sampling of the new products introduced in Chicago last November; we’ll present more product introductions from the show in future issues of MetalForming. As part of the show’s activities, the Precision Metalforming Association (PMA) Next Generation Leaders Division awarded three exhibiting companies with Innovation Awards. Next-generation leaders in attendance at the tradeshow visited the booths of companies displaying new materials, equipment/services, and software/machine controls, and then evaluated those companies to determine the winners of the third-annual Next Generation Innovation Awards. Winners were presented with a certificate from Division Chair Jeff Aznavorian of Clips and Clamps Industries, and Vice Chair Rick Bachman of Feintool North America. The Best New Equipment/Service Innovation Award went to Magnetic Products, Highland, MI, which displayed the Micromag high-intensity magnetic filter manufactured by Eclipse Magnetics, based in Sheffield, UK. Micromag filtration technology uses high-power neodymium rare-earth magnets to remove ferrous and paramagnetic contamination from fluids and proves particularly effective with machine-tool oils, coolants and hydraulic-fluid machinery systems. Removed contamination can be recycled, eliminating disposal costs, and high filtration efficiency means lubricants and coolants last longer; www.mpimagnet.com, www.eclipse-magnetics.co.uk. that offers state-of-the-art pressroom data collection. The new release provides customers with more accurate calculations of overall equipment effectiveness in applications where the speed of the job is limited by machine configuration. LETS Version 3.4 calculates OEE by applying an ideal rate for each part/machine combination. 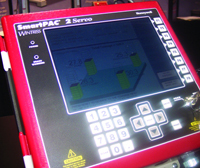 Wintriss also introduced its SmartPac2 Servo, (above) a control package developed specifically for servo-mechanical presses. The control uses a inear position sensor to monitor slide position and then save unique bottom and top return positions for each die. 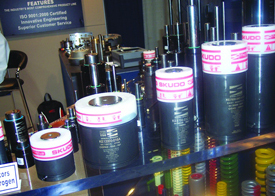 It can monitor as many as 10 stages of slide motion, and features three selectable, built-in motion curves for programming limit switch and sensor timing—sinusoidal (similar to a mechanical press), proportional (similar to a hydraulic press) and asymmetrical (three variable-resolution curves are built in, proportional through the top of the stroke with high-resolution areas at the bottom); www.wintriss.com. The Best New Materials Innovation Award went to Tower Oil & Technology Co., Chicago, IL, for developing Saf-T-Vanish, a synthetic, VOC-free stamping lubricant to replace typical vanishing oils. Saf-T-Vanish contains no hazardous ingredients, uses renewable resources and is totally biodegradable. Drying time is typically half that of solvent-based fluids, and the lubricant does not contain the typical extreme pressure additives, has a high lubricity factor and offers excellent corrosion protection; www.toweroil.com. Link Electric & Safety Control Co.
Metalformers looking to upgrade the controls on manually fed or moderately automated presses with an affordable resolver/encoder-based press controller need look no further than the new OmniLink System 5100-MPC package from Link Electric & Safety Control Co., Nashville, TN. As described by company officials, the control is ideal for use on smaller presses that don’t need more expensive and feature-laden controls. 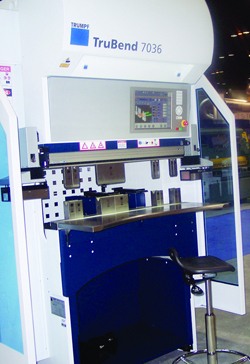 It features the OmniLink 805 operator terminal, System 5100 card rack and other System 5100 components that provide motor and clutch-brake control, auxiliary press-system control, automation sequencing and interface and production-process monitoring. A completely new type of shaker conveyor was introduced by Pax Products, Celina, OH, called the EGD (ellipelliptical gear driven) conveyor. 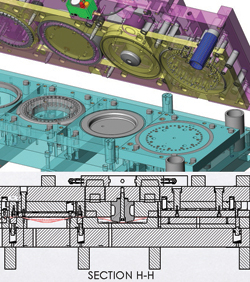 The elliptical gear drive produces a reciprocating, varying acceleration motion that conveys parts and scrap exiting a stamping die out of the press area. Compared to a standard linkage design, the use of elliptical gears in a sealed gear box, company officials say, provides four times the acceleration rate and a significantly higher conveying speed at a lower RPM. finite-element analysis) and flat-blank prediction, including animation of the forming process. continue to get leaner and more responsibilities and work load are falling on the shoulders of those highly skilled operators that remain, I’m constantly on the lookout for suppliers focused on improving the ergonomics of their machines. Not because OSHA says to do so, but because refined ergonomics in the manufacturing environment contributes mightily to productivity and profitability. One supplier that gets it is Trumpf, Farmington, CT, which debuted the Fabtech crowd its new ergonomically optimized TruBend Series 7000 press brake. While state-of-the-art control technology has brought outstanding reliability and repeatability to the resistance-welding process in terms of precise weld timing and current, not until the addition of servo-actuated welding machines has the variable of welding pressure also enjoyed such precision. And T. J Snow Co., Chattanooga, TN, has accomplished just that with its new servo-actuated press welders that offer a slow approach of the upper welding electrode to minimize electrode wear and optimize weld appearance; improved weld-force repeatability; and instant generation of weld force—no need to wait until air pressure builds as with a pneumatic system.